The Tale of Peter Rabbit is a children’s book written and illustrated by Beatrix Potter that follows mischievous and disobedient young Peter Rabbit as he is chased about the garden of Mr. McGregor. He escapes and returns home to his mother who puts him to bed after dosing him with camomile tea. The tale was written for five-year-old Noel Moore, son of Potter’s former governess Annie Carter Moore, in 1893. It was revised and privately printed by Potter in 1901 after several publishers’ rejections but was printed in a trade edition by Frederick Warne & Co. in 1902. The book was a success, and multiple reprints were issued in the years immediately following its debut. It has been translated into 36 language and with 45 million copies sold it is one of the best-selling books of all time. The book has generated considerable merchandise over the decades since its release for both children and adults with toys, dishes, foods, clothing, videos and other products made available. Potter was one of the first to be responsible for such merchandise when she patented a Peter Rabbit doll in 1903 and followed it almost immediately with a Peter Rabbit board game. By making the hero of the tale a disobedient and rebellious little rabbit, Potter subverted her era’s definition of the good child and the literary hero genre which typically followed the adventures of a brave, resourceful, young white male. Peter Rabbit appeared as a character in a 1971 ballet film, and the tale has been adapted to an animated television series. Peter Rabbit, his sisters Flopsy, Mopsy, and Cottontail, and his mother are anthropomorphic rabbits who dress in human clothing and generally walk upright on their hind legs, though they live in a rabbit hole under a fir-tree. Mother Rabbit has forbidden her children to enter the garden of Mr. McGregor: it was there that their father met his untimely end and became the ingredient of a pie. 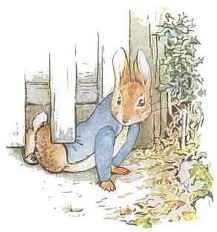 However, while Mrs. Rabbit is shopping and the girls are collecting blackberries, Peter sneaks into the garden. There, he gorges on vegetables until he gets sick, and is then chased about by Mr. McGregor. When Peter loses his jacket and his shoes, Mr. McGregor uses them to dress a scarecrow. After several close encounters with Mr. McGregor, Peter escapes the garden and returns to his mother exhausted and ill. She puts him to bed with a dose of camomile tea while his sisters (who have been good little bunnies) enjoy bread and milk and blackberries for supper. 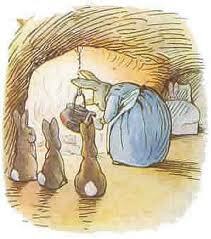 In a 1904 sequel, The Tale of Benjamin Bunny, Peter returns to McGregor’s garden to retrieve his lost clothes.